EarthCalm utilizes this same principle of cyclotronic resonance to introduce a healing or grounding pattern into the home's EMF field. A pattern of circuits is modulated into the EMF field of the home by inserting it into the home's electrical system. The nervous system of a person within the home will utilize this same principle of cyclotronic resonance to receive the grounding pattern thus alleviating the stressful effect of the EMFs. The 14EarthCalm circuits are transferred by resonance to each person's nervous system, thus allowing the nervous system to ground and dissipate manmade generated current. The person thus receives benefits that include increased calmness, and increased protection against arthritis, depression and Alzheimer's. EarthCalm products never need recharging and are offered with a 90 day money back guarantee to afford you the time to monitor the effectiveness yourself. Note and jot down your specific symptoms now as well as those of your family, and then compare them after using our Scalar Home Protection System for several weeks. 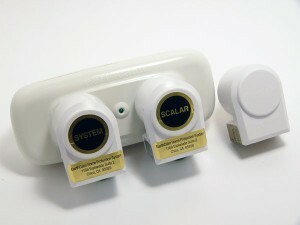 Symptoms such as chronic headaches, asthma attacks, arthritic pain, high blood pressure and old injuries have improved due to the effectiveness of the EarthCalm Scalar Home Protection System to protect the nervous system from the effects of home electricity and microwave radiation.